Your CD will be the first to ship when completed in April! 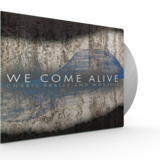 We Come Alive is a collection of songs birthed out of a desire for the church to really know that God has designed us to COME ALIVE in Him. Largely written by Charis staff members, these songs are God-breathed, and they awake the listener to the voice and activity of the Holy Spirit in believers’ lives. To walk in the fullness of God is to know who we are and what we’re about. He is for us, He is alive in us, and we activate the power of His Spirit in us by meditating on Him, His Word, and His goodness to us. Through this worship experience, it is our prayer that you will COME ALIVE in His promises for you! The past is behind you. Only His faithfulness remains ahead.